Believe it or not, there are still millions of people, doctors, pharmacists and even journalists who do not yet realize there is a very high concentration of mercury in influenza vaccines given to pregnant women. Most people, you see, have been lied to by the media which has stated over and over again that mercury was removed from all vaccines. It's still there. And toxic mercury is present in influenza vaccines at a level that's literally 25,000 times higher than the EPA limit of mercury in drinking water. (1) It's 100 times higher than the highest level of mercury contamination I've ever tested in ocean fish. 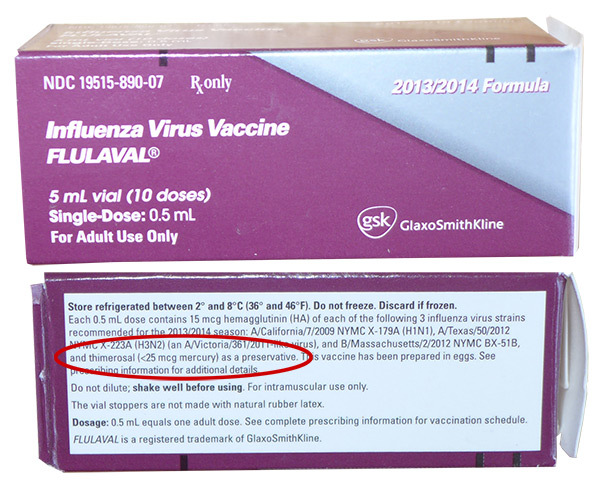 As you can see below, the box for this Flulaval Influenza Virus Vaccine readily admits the use of thimerosal which contains mercury. (Of course, you have to use a magnifying glass to see this.) In microscopic text on the package insert, it says straight out, "Register women who receive Flulaval while pregnant in the pregnancy registry by calling 1-888-452-9622." Yet, at the same time, the insert also admits that "safety and efficacy have not been established in pregnant women." It's also important to note that when people are being given flu shots, they are never handed the package or the insert, so they have no opportunity to read any of this information unless they specifically ask for it. It's not like a food item with a "Nutrition Facts" label. Vaccines are sold in "stealth" mode where patients have no idea what's in them and no opportunity to read possible warnings. As further proof of this point, consider the fact that this flu vaccine comes with only one insert, yet it's a 10-dose vial intended to be injected into 10 different people. Clearly, if there's only one insert but 10 people, then 9 out of 10 people can't possibly be handed the insert. 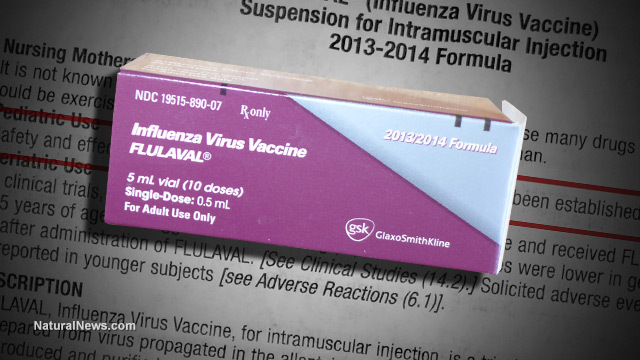 The second piece of evidence to reveal here is the package insert for the influenza vaccine, a document printed in microscopic text that's almost impossible to read without a magnifying glass. As you can see from this snapshot, the package insert readily admits that each vaccine dose "contains 50 mcg thimerosal (<25 mcg mercury)." In case you're wondering, "mcg" means micrograms. A microgram is 1/1000th of a milligram. Mercury is toxic at any dose when injected into the body, even in micrograms. There is no such thing as a "safe" form of mercury when injected. In fact, the ethyl form of mercury used in vaccines is many times more toxic than methyl form once it enters human cells. Click here for a fascinating interview with mercury toxicity expert Dr. Chris Shade who explains this. What's even more astonishing about this insert is that it openly admits the flu shot is a complete medical hoax, backed by nothing but voodoo woo woo faith-based dogma (and clever marketing). For those "mercury denialists" who still can't believe flu shots given to pregnant women contain high concentrations of toxic mercury, even the CDC reluctantly admits this fact on its own website. The final piece of irrefutable evidence on all this comes from my own scientific laboratory, where I run ICP-MS instrumentation to test foods, beverages, dietary supplements and other items for heavy metals contamination. I was the first food researcher to document high levels of tungsten in brown rice protein, and I've exposed alarming levels of lead in pet treats. I've also exposed high lead in ginkgo biloba herbal supplements imported from China. Why was I shocked? Because I don't recall ever seeing anything run through my ICP-MS instrument with that high a concentration of mercury. 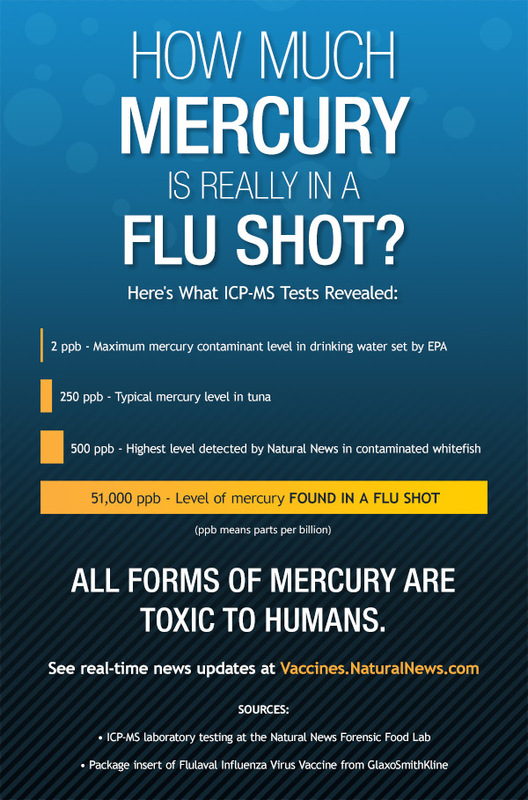 The mercury in this flu vaccine was the HIGHEST concentration of mercury I've ever seen in anything, period! And this is a product that's injected directly into the bodies of pregnant women, where mercury goes right into the developing fetus. Amazing, huh? What's even more interesting is that this finding once again confirms the accuracy of my lab instrumentation because it's almost in perfect agreement with the level of mercury detailed on the vaccine package insert. So, I can confidently say that the flu vaccine won't poison you with lead, cadmium or arsenic because it contains none of those things. Even the aluminum level is quite low and not a concern at this very low level. The real problem is just the mercury, at least as far as elements go. 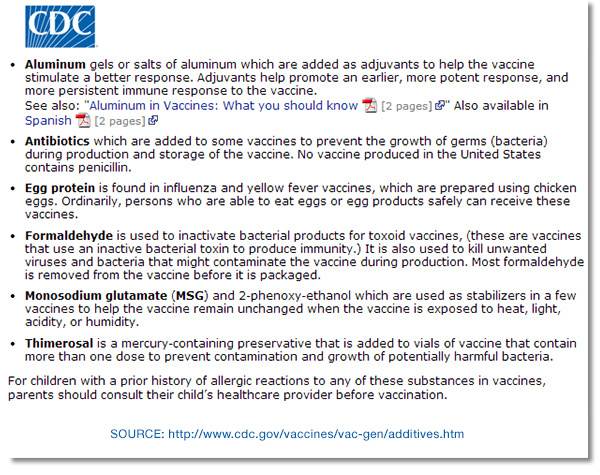 Why won't vaccine makers remove the mercury? Good question. Everybody knows mercury is toxic to inject into the human body. That's not debated except by irrational anti-science denialists who refuse to acknowledge the Table of Elements. And if vaccine promoters, propagandists and patent holders want the world to accept all their vaccines, why don't they just remove the mercury and be done with it? If they take out all the toxic elements, resistance to vaccines would all but evaporate. 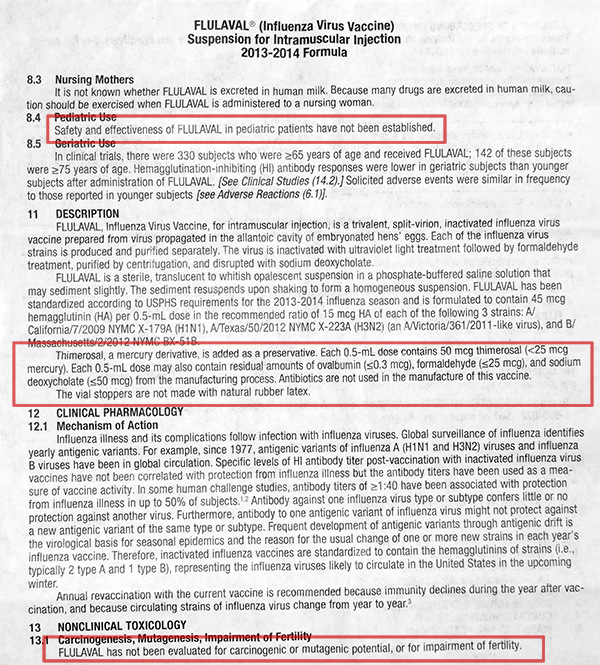 Ever wonder why they don't conduct legitimate clinical trials on flu vaccine efficacy? Probably because they know the results would have to be faked to show any efficacy at all. That's what Merck did with its mumps vaccines, according to two former virologists who worked there. They spiked human blood samples with animal antibodies to fabricate positive results. Yep, vaccines work so poorly that even the manufacturers have to fake their own results to show any efficacy. How's that for medicine we can all trust? Think about it: this is a product that contains multiple neurotoxins in very high concentrations; a product backed by no safety trials or efficacy data; a product linked to numerous serious adverse reactions; and yet a product that enjoys absolute legal immunity thanks to the U.S. government. If that's not outright medical quackery, I don't know what is. For the record, I'm not an opponent of all vaccines. But I do believe -- as do a rapidly increasing number of other clear-thinking people -- that medicine should not poison our women and children. It's time for mercury to be removed from all vaccines, once and for all. Anything less is medical negligence. Ever wonder why most of my stories on vaccines go viral across the 'net? The answer is simple: People are hungry for the truth, and even when desperate naysayers try to attack what I'm saying, all they do is send more people to Natural News to check out the facts. Those people then discover the truth and share it. When the facts are on your side, you will always win over more people to your message of truth. And when it comes to mercury in vaccines -- and the hilarious medical hoax that claims flu shots are safe and effective -- the truth is printed right on the package insert, in black and white. Every time we print the truth, we gain more amazing fans and readers who keep sharing that truth with others. We are powered by all those who seek the truth and seek to protect and defend our children and our planet from toxic chemicals and heavy metals. It's also a truism that the 99% don't trust the lying 1% who run drug companies in the first place! Everybody knows the drug companies are criminal operations. The U.S. Dept. of Justice has proven that over and over again with criminal felony prosecutions and billion-dollar settlements against the world's top vaccine manufacturers (including GlaxoSmithKline). That's primarily how we've grown from zero readers to over 7 million monthly readers: by boldly telling the truth and trusting in the intelligence of readers to recognize the difference between compassionate truth and for-profit corporate propaganda. Ultimately, We the People will be victorious in the removal of mercury from all vaccines -- an idea that's already well accepted across much of Europe. And when that day comes, it will be yet another victory for the Natural News fan base, an amazing community of millions of remarkable people working together for the protection of our children, our health and our world.